The twin-peaks of Mt. 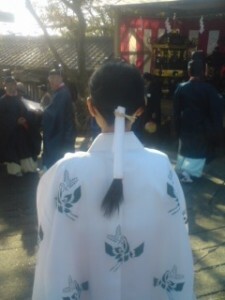 Tsukuba have long been considered a symbol of the male and female forces. At 877 meters it is not very high or majestic. But for those of us who live on the vast (by Japanese standards, of course!) 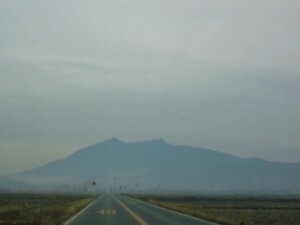 plain to its south, the slightly crushed M figure of Mt Tsukuba is like a trusty old friend, always reassuring us of where we are and helping us get our bearings when we are lost. No less important, its forested slopes put Japan’s seasons on display for us while on the flatlands below the greenery has been disappearing at a frightening pace and snow accumulation has become a rare occurrence. It also carries plenty of cultural and historical significance. 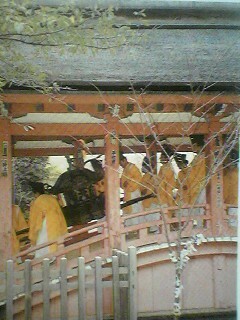 For the Japanese, Mt Tsukuba has been a sacred mountain since time immemorial. Its twin peaks have apparently long symbolized the interaction of the Male and Female Forces (the Yin and Yang) for the inhabitants of the area. In fact, we know from poems in the Manyoshu ( compiled in the 7th century), and from references in the ancient chronicles of this area ( the 8th century Hitachi no Kuni no Fu-doki) that twice a year, in spring and fall, a great COUPLING festival now known as the KAGAI (or UTAGAKI),　was held at what is now called Mt Tsukuba ( and several other mountains in what is now Ibaraki and other places in Japan). Though no one now knows exactly what went on at these affairs, it seems certain that groups of men and women would gather at separate areas at the foot of the mountain and then climb to the valley between its peaks. There, men would try to pair off with the women with the composition of and recitation of poems used as the main way of hooking up. Just what would happen next can only be left to conjecture, though some believe that the KAGAI was a bi-annual festival of free (sexual) love. The purpose being, as suggested by anthropologists, was not only to facilitate young people`s finding of a marriage partner, but as a magical fertility ritual which would help guarrantee good harvests. 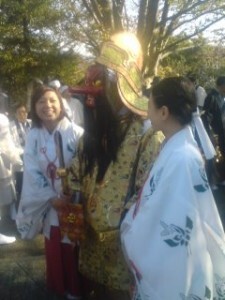 Just when the KAGAI tradition died out no one is really sure, though by the Heian Period, it seems to have already disappeared, as under the influence of the Yamato Court the twin peaks came to be associated with the ancestral Gods of Japan, Izanagi and Izanami, who are now enshrined there. The mountain has attracted many holy men over the years and during the Edo Period (1600-1867) a temple was built half-way up its southern slope to protect Edo castle from the unlucky North-Eastern quadrant, and this temple, then Chuzen-Ji, was generously endowed and supported by Japan’s long-ruling clan, the Tokugawa. In 1868 Japan underwent revolutionary reforms and the Emperor was restored (again?) to supreme power (in name only, most say). The Meiji government also carried out a probably ill-advised policy (though not as ill-advised as some other policies set in those days!) of separating Buddhism (a foreign import) from the pure, native belief which came to be called Shinto. Thus Chuzen-Ji is now Mt Tsukuba Shrine, popular ( quite appropriately) as a place to pray for marital happiness. And I think that it can be said, that despite the fact that the KAGAI has died out, its spirit lives on in sublimated form in a ceremony held twice a year at the mountain. 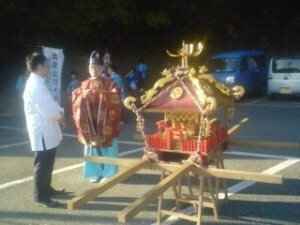 The priests of the Mt Tsukuba Shrine, together with the assistance of local residents, have continued to perform what is considered the most important of the mountain’s living rituals: the Onzagawari (御座替り）- also known as Ozagawari or even OZAGARI. This ceremony takes place on April and November 1. 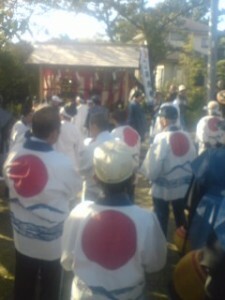 The ceremony at first appears to be a typical Japanese Mountain God festival in which the deities are brought down to the fields in spring to bring abundant harvests, and are then escorted back up to their mountain abodes for the winter. Mt Tsukuba’s spring and autumn rituals seem at first glance to be of this pattern, but there is a twist. 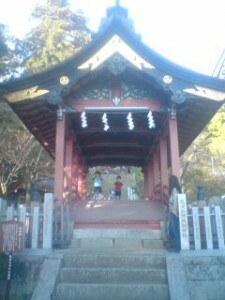 Since the ancestral couple are enshrined on its peaks and the shrine half-way up the mountain is dedicated to family harmony, instead of focusing on agriculture the Ozagawari emphasizes love and protection of children (which are the result of the interaction of the male and the female). 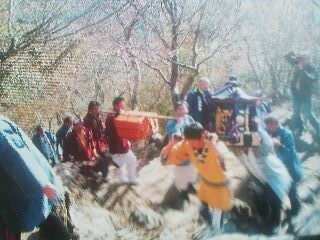 Last April 1st, a procession carried a small omikoshi (portable shrine) bearing the child god up the mountain, where it is cool, high above the sweltering lowlands and at the same time the parent gods were carried down to the center of the mountain. The positions of the parents and child will be switched back again in autumn ( on the morning of Sunday Nov. 1st 2013 ). The ceremony begins early in the morning and continues till late afternoon as carriers bear the omikoshis up and down the mountain (they use the cable car for some of the way). You can join this procession if you get to the main Hall of the Shrine at 7:30 AM or thereabouts. 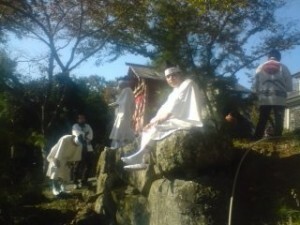 The best ( and most common) way to observe this ceremony is to wait at the stone torii gate in the area called ROKU CHO-ME (六丁目), which is a few hundred meters below the former Tsukuba Post Office ( now a museum), on the old pilgrims road to the Mt Tsukuba Shrine. At 2 PM, you will find a small group gathered ( a mere shadow of the crowds that used to amass there) along with the local parishioners dressed in their festival wear. There is usually some music ( played by local amateurs) and always some prayers before things get underway at 2:30. 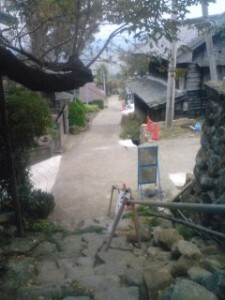 By getting underway I mean that the OMIKOSHI bearing either the parent or child gods ( depending on the season) will be born unto the parishioners shoulders and then carried trudgingly up the steep stairway, and then along the road, to the Mt. 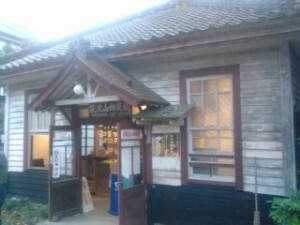 Tsukuba shrine. 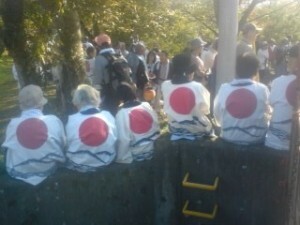 A few very old residents can be found sitting along the procession`s path waiting for it to pass. I wonder how they must feel when they see how this great event of their childhoods has now been all but forgotten. Besides photographing the picturesque procession, maybe the most special thing that a visitor can do on these ceremony days is to cross the sacred bridge (a red, wooden, covered bridge of rare design) at the Mt Tsukuba Shrine, which is only open on the first days of April and November. If you miss the OZAGAWARI this week, maybe I`ll see you there on April 1st when they do it all again- but in reverse! 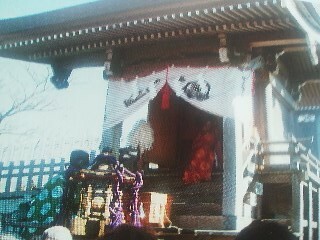 and then to the Female Peak (Nyotai zan) where another ceremony will be held (probably at around 10:45). 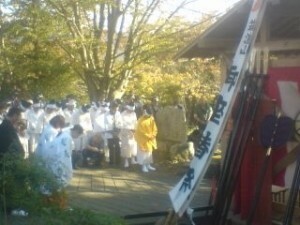 This procession will then proceed via the Benkei Nanamodori where there will be lunch at noon (for Ujiko). They will then proceed to Roku-Cho-Me where the there will be many onlookers waiting. for the 2:30 start. 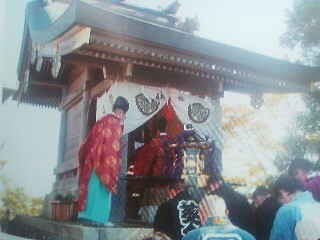 Another idea would be to just wait up at the shrine for the procession to arrive. The sacred bridge will be crossed at 4pm. Its a beautiful season to walk the Old Tsukuba Road to Poku-Cho-Me. The oranges, pomegranates, quince and persimon are weighing down all the trees. The weather should be great tomorrow as well. Hope to see you there!